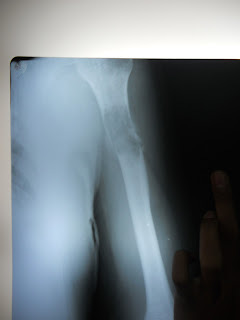 Patient is a 50 yr old male who presented to us with pathological fracture in left humerus. Incidentally patient has Carpal tunnel syndrome on opposite side. His work up shows ALP↑↑ ; PSA levels, Sr Calcium & phosphorus with in normal range; Hb electrophoresis shows no M spike. Specimen shows blood clot with entrapped sheets of mature plasma cells along with focal areas showing plasmacytoblasts. Russel bodies and dutcher bodies seen. Features are consistent with plasma cell Neoplasm. 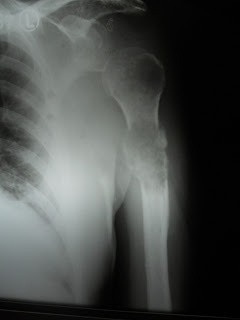 Bone scan shows no hotspots elsewhere in the body..
Radiograph shows lytic lesion, no zone of transition, no soft tissue reaction, in 50 years old - Secondary bone tumour is likely. Have you done bone scan?